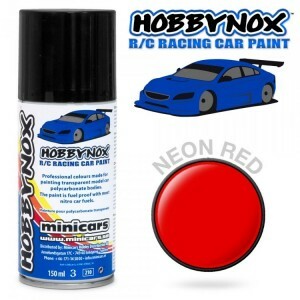 The Lexan® / Polycarbonate paint - now with a series of 150 ml spray cans in the popular colors of today. Ready to use, quick drying, fuel resistant and light weight paint for racing. Normally two thin layers of neon red is needed - make sure that it dries completely before covering it with white. If you forget the white it will not look "neon". Hobbynox™ - Making you look good!